Copyright © 2000-2019 Suburban Cyclists Unlimited. This calendar is presented by Suburban Cyclists Unlimited, and lists recreational bicycle events that take place in Pennsylvania, New Jersey and Delaware, and start within approximately 150 miles of Horsham, Montgomery County, Pennsylvania. As of January 1, 2019, events in Maryland, New York and Connecticut will no longer be listed on this calendar. See Other Bicycle Event Calendars for bicycle events outside of the coverage area of the SCU calendar. Please use the Contact Us form (select "Regional Calendar Editor") to submit an event for this calendar. NOTE: The start location must be within 150-miles of Horsham, PA. Recreational rides in PA, NJ or DE. Join SCU and save $10 on Quad County registration! Thu.-Sat. April 4-6, East Coast Greenway Mid-Atlantic Summit, Philadelphia, PA.
April 6-7, 2019, Tandem Expo, Pittsgrove, NJ. Free admission. Sat. April 20, 2019, New Holland Bicycle Race, New Holland, PA. Ride/race 30 or 50+ mi through scenic Lancaster County with 2000-4300 ft climbing. Sat. April 27, 2019, Bethesda Taxing Metric Century, Warwick County Park, Knauertown, PA. Ride 21, 32, 46 or 63 mi through scenic western Chester County. New routes available with less climbing than previous events. Lunch stop with hot homemade soups and baked goodies. Benefits Bethesda Project - A Caring Family for Philadelphia's Homeless. Sat. April 27, 2019, Cumberland Valley TrailFest, Shippensburg, PA. This year the Cumberland Valley Rail-to-Trail Council's Race, Run, Ride & Ramble is joining forces with the Shippensburg Historical Society's 3rd annual BrewFest to create the Cumberland Valley TrailFest. Sat. April 27, 2019, Ocean to Bay Bike Tour, Bethany Beach, DE. Ride 30, 50, 62 or 100 mi on flat terrain. Sun. April 28, 2019, Tour de Franklin, Somerset, NJ. Ride 10, 25, 40 or 62 mi on-road, or ride 5- or 10 mi along the scenic Delaware & Raritan Canal. Fundraising is optional. Benefits the Franklin Township Foodbank. Sun. April 28, 2019, Tour de Scranton, Scranton, PA. Choice of 6 Routes, 7-to-65 mi: ride on-road, or ride off-road on the Lackawanna River Heritage Trail. Benefits the Erin Jessica Moreken Drug & Alcohol Treatment Fund. Sat. May 4, 2019, Spring VeloFest, Valley Preferred Cycling Center (Trexlertown Velodrome), Breinigsville, PA. Outdoor swap meet. 8:30am to 2:00pm. Sat. May 4, 2019, Tour de Tuckahoe / Gravel Grinder, Amanda's Field, Woodbine, NJ. Road and/or gravel ride in South Jersey: 20- or 62-mi road routes and 38- or 50-mi gravel grinder. The gravel routes are new for 2019. Sat. May 4, 2019, Wheels for Meals, Dogfish Head Brewery, Milton, DE. Ride 12, 25 or 50 mi. Benefits Meals on Wheels Lewes-Rehoboth. Sun. May 5, 2019, Cinco de Mayo Benefit Bike Ride, Exton, PA. Ride up to 23 mi on the paved Chester Valley Trail, or ride 25 or 50 mi on the scenic, hilly roads of Chester County. Fundraising is optional. Benefits Pennsylvania Center For Adapted Sports. Sun. May 5, 2019, Spencer Martin Memorial Bike Ride for Habitat, Lehman, PA. Ride 35 mi. Benefits Wyoming Valley Habitat for Humanity. Sat. May 11, 2019, Pedal for Promise, Tabernacle, NJ. Ride 15, 30, 42 or 62 mi. $100 minimum fundraising, benefiting UrbanPromise. Wed. May 15, 2019, Ride of Silence. Simultaneous, free events at many locations including Doylestown and Philadelphia. Please see the event's website for a complete list of start locations - too many to list here! Join cyclists worldwide in a silent slow-paced ride (max. 12 mph) in honor of those who have been injured or killed while cycling on public roadways. 7:00pm ride start, but come early for the pre-ride dedication ceremony. Sat. May 18, 2019, SCU Quad County Century, Green Lane, PA. Start from scenic Green Lane Park in rural western Montgomery County, and ride 26-100 mi in low-traffic sections of Montgomery, Bucks, Berks, and Lehigh Counties. Registration includes free lunch with vegetarian options. Rest stops have a large assortment of home-baked snacks. Low-cost overnight camping is available at the start location. Join SCU and save $10 on registration! Suburban Cyclists Unlimited. Sun. May 19, 2019, Cheers & Gears Wine Ride, Landisville, NJ. Ride 30 mi. Sat. May 25, 2019, Bike4Beds Ride Alloway, Woodstown, NJ. Ride 45 mi on flat terrain. Fundraising is optional. Benefits orphanages in Haiti and rebuilt schools and hospitals in Africa and Haiti. Rain date June 8, 2019. Sat. June 1, 2019, Broadcreek Bike and Brew, Laurel, DE. Ride 15, 25, 50, 62 or 100 mi on flat terrain. Presented by the Western Sussex Chamber of Commerce to Benefit Nanticoke Health Services. Sat. June 1, 2019, Double Creek Tour, John Rudy Park, York, PA. Ride 10, 25, 50 or 62-mi. Benefits the Healthy Community Pharmacy, serving uninsured or under-insured patients. Sat. June 1, 2019, Legacy Bike Ride, Stockton University, Galloway, NJ. Ride 12, 30 or our 62 mi. Benefits Stockton University scholarship fund. Sat. June 1, 2019, St. Luke's Hospice Charity Bike Ride, Lehighton, PA. This is a 20- or 30-mi trail ride. Benefits St. Luke's Hospice. Sat. June 1, 2019, The Ride, Rowan College at Gloucester County, Sewell, NJ. Ride 10, 25 or 50 mi through South Jersey's farmlands and vineyards. Fundraising is optional. Benefits Gloucester County Special Services Education Foundation (GCSSEF). 2019 date from Facebook. Sun. June 2, 2019, Go the Distance for Autism, Bergen Community College, Paramus, NJ. Ride 3, 10, 25 or 62 mi. Benefits the Alpine learning Group, the Epic School, Garden Academy and REED Academy. Sun. June 2, 2019, Move for Mental Health, Laurel Acres Park, Mount Laurel, NJ. Ride 25 or 50 mi. Benefits King's Crusade, a local charity whose mission is to conquer the opioid epidemic. Sun. June 2, 2019, Tour de Belt, Harrisburg, PA. This is a 20-mi bike tour of the PA Capital Area Greenbelt. Benefits the Capital Area Greenbelt Association. June 6-9, 2019, Ride for Homes, Strasburg, PA. The fundraising requirements are $400 per day or $1,400 for all 4 days. Benefits Habitat for Humanity. Sat. June 8, 2019, Cory's Ride, Rosedale Park, Pennington, NJ. Ride 20 or 40 mi. Benefits the Cory Golis / Anchor House Scholarship Fund. Sat. June 8, 2019, Leap Frog Bicycle Tour, Felton, DE. Ride 32 or 64 mi from pond-to-pond in central and southern Delaware. Sat. June 8, 2019, Million Dollar Ride, Philadelphia, PA. Ride 13, 34 or 72 mi. Benefits Penn Medicine Orphan Disease Center for rare disease research. Sat. June 8, 2019, Ride for Autism, Brookdale Community College, Lincroft, NJ. Five routes from 10 to 100 mi. Fundraising is optional. Benefits Autism New Jersey. Sat. June 8, 2019, Tour de Lebanon Valley, Lebanon, PA. Ride 10, 25 or 62 mi on rolling-to-hilly terrain. Benefits the Lebanon Valley Conservancy land preservation program. Sat. June 8, 2019, Tour de Tush, Grange Park, Allentown, PA. Ride 10, 30 or 60 mi in the scenic, low-traffic area west of Allentown. Benefits the Colon Cancer Coalition. Sun. June 9, 2019, ACS Bike-a-Thon, ride one-way to Atlantic City from various start locations. Start from Philly at 6:30am and ride across the Ben Franklin Bridge. Benefits the American Cancer Society. Sun. June 9, 2019, French Creek Iron Tour, Kimberton Fire Company Fairgrounds, Phoenixville, PA. 11-100 mi, rolling-hilly. Benefits the French & Pickering Creeks Conservation Trust. Sun. June 9, 2019, Miles for Matheny, J. Malcolm Belcher Fairgrounds, Far Hills, NJ. Ride 10, 25, 35 or 50 mi on rolling-hilly terrain, or the extra-hilly "Hills of Attrition" route. 700 to 4,900 ft of climbing. Also offers a 5k run, fitness walk, wheelchair walk, and kids fun run. Benefits the Matheny Medical and Educational Center. Sun. June 9, 2019, Tour de South Brunswick, South Brunswick, NJ. Ride 4, 10 or 25 mi. Benefits the Education Foundation of South Brunswick Township. Sat. June 15, 2019, Bikes & Beers Flying Fish, Flying Fish Brewery, Somerdale, NJ. Ride 15 or 30 mi. Registration includes 2 Flying Fish beers after the ride and a souvenir pint glass. Sat. June 15, 2019, Greater Philadelphia Tour de Cure, Delaware Valley University, Doylestown, PA. Ride 3, 12, 35, 63 or 100 mi. Benefits the American Diabetes Association. Sat. June 15, 2019, Ride to Type None, Total Turf, Pittman, NJ. Ride 25, 50 or 62 mi. Each rider is required to raise $150, but your registration fee counts towards this total. Benefits JDRF South Jersey Chapter. Sat. June 15, 2019, Roll & Stroll, Souderton, PA. Ride 10, 20, 40 or 62 mi on rolling-to-hilly terrain. Fundraising is optional. Benefits the Indian Creek Foundation. Sat. June 15, 2019, The Longest Day Ride, Matamoras, PA, to Cape May Lighthouse, NJ. Ride 212-mi one-way. Riders must pre-register and join CJBC. Sat. June 22, 2019, Ride to Thrive, Burlington County Fairgrounds, Columbus, NJ. Ride 18, 30, 45 or 63 mi. Fundraising is optional. Benefits the Legacy Foundation. June 22-23, 2019, Pennsylvania Hope Ride, Hershey, PA. Saturday one-day ride: 30 or 62 mi starting and ending at the Hope Lodge in Hershey PA. Saturday-Sunday two-day ride, 75 mi each day with overnight stay at Kutztown University. Benefits the American Cancer Society. Sun. June 23, 2019, Bike Ride for Amy, South Brunswick, NJ. Ride 15, 25, 35 or 50 mi. Benefits the Amy Feiman Behar Foundation, created to increase the early detection and treatment of breast cancer for uninsured women. Sun. June 23, 2019, Black Tie Bike Tour, Capital Health Medical Center Hopewell, Pennington, NJ. Ride 10, 25 or 50 mi. $150 minimum fundraising; benefits the Capital Health Center for Oncology at Capital Health Medical Center - Hopewell. Sun. June 23, 2019, Chester County Challenge for Cancer, West Chester, PA. Ride 5, 10, 30, 50 or 65 mi. Benefits the Cancer Program at The Chester County Hospital and Neighborhood Health. June 28-30, 2019, Ride for New Beginnings, Toms River, NJ. Ride 184 mi in 3 days: Toms River - Atlantic City - Voorhees - Toms River. $750 minimum fundraising; benefits Ocean’s Harbor House, a safe haven for youth in Ocean and Monmouth Counties. Sat. June 29, 2019, Propel 100 Charity Bike Ride, Kennedy Center, Willingboro, NJ. Ride 12, 30, 50, 68 or 100 mi through Burlington County. Fundraising is optional. Organized by Goals Start Now and benefiting cancer patient support services at Virtua Memorial Hospital. Sat. July 13, 2019, Bikes & Beers Victory, Victory Brewery, Parkesburg, PA. Ride 15 or 30 mi. Registration includes 2 Victory beers after the ride and a souvenir pint glass. Sat. July 13, 2019, New Holland Bicycle Race, New Holland, PA. Ride/race 30 or 50+ mi through scenic Lancaster County with 2000-4500 ft climbing. Sun. July 21, 2019, Flyers Charity Classic, Philadelphia, PA. Ride 9, 31 or 62 mi, or 5km walk/run. Flyers Fan Fest. Benefits the Flyers Charities and the Flyers Alumni Association. Sun. July 28, 2019, The Ben to the Shore Bike Tour (formerly the "Irish Pub Tour de Shore"), Philadelphia, PA to Atlantic City, NJ. Ride 65-mi one-way, or start from Berlin, NJ for a 50-mi ride. Benefits Families Behind the Badge Children's Foundation which supports the families of fallen first responders. July 28 - Aug. 3, 2019, Pennsylvania Perimeter Ride Against Cancer, Pittsburgh to Palmerton, PA. 500 mi. Benefits the American Cancer Society. Sat. Aug. 3, 2019, Blue Haze Dayz Ride, Blueprint Brewery, Harleysville, PA. This is a new event for 2019! Ride 15, 30 or 50 mi. Registration includes T-shirt, two Blueprint beers and a brewery tour. Organized by Indian Valley Bikeworks and benefiting Penn Medicine Abramson Cancer Center and Bucks for Bikes. Sat. Aug. 3, 2019, Chocolate Tour, Hershey, PA. Ride 10, 30, 50, 75 or 100 mi. Benefits Penn State Milton S. Hershey Medical Center. Sat. Aug. 10, 2019, Nightmare Tour, Reinholds, PA. Ride around the perimeter of Lancaster County: 111, 177, 200, 225 mi or 24 hrs, with 8,900 to 22,000 ft of climbing. Pre-registration is mandatory. Sun. Aug. 11, 2019, Philadelphia CF Cycle for Life, Conshohocken Brewery, Conshohocken, PA. Ride 10, 20, 34 or 65 mi. Benefits the Cystic Fibrosis Foundation. Sun. Aug. 18, 2019, Lancaster Covered Bridge Classic, Lancaster, PA. Very scenic 16-, 33-, 65- and 100-mi routes through Amish farmlands on rolling terrain with a few hills. Advance registration is required - no day-of-event registration. Proceeds benefit the Lancaster Bicycle Club's grant program. Sun. Aug. 18, 2019, Ramapo Rally, Campgaw Mountain Ski Area, Mahwah NJ. Ride 12, 25, 50, 62 or 100 mi. Bicycle Touring Club of North Jersey (BTCNJ). Fri.-Sat. Aug. 23-24, 2019, Pennsylvania Dutch Farm to Fork Fondo, Ronks, PA. Ride 9, 33, 45 or 82 mi. Pre-registration required. Sun. Aug. 25, 2019, Brandywine Tour, Kennett Square, PA. Ride 24, 50, 67, 82 or 100 mi on rolling-to-hilly terrain through the scenic Brandywine Valley and western Chester County. New this year: the “easiest” 50-mi route in years, with long flat stretches. Delaware Valley Bicycle Club. Sat. Sept. 7, 2019, Amish Country Bike Tour, Dover, DE. Ride 16-100-mi on flat terrain. Sat. Sept. 7, 2019, Sourland Spectacular, Skillman, NJ. Ride 5, 26, 38, 52 or 65 mi. All routes include climbing, as Sourland Mountain is beautiful, but not flat. Benefits the Sourland Conservancy. Sat. Sept. 7, 2019, South Jersey Tour des Farms, Vincentown, NJ. South Jersey Resource Conservation & Development Council. 2019 date from Facebook. Sun. Sept. 8, 2019, Thompson Cyclosportif, Doylestown, PA. Ride 31 or 60 mi. Held in conjunction with the Thompson Criterium men's and women's professional races, amateur races, and the Doylestown Arts Festival. Sat. Sept. 14, 2019, Foster 100, Cooper River Park, Pennsauken Township, NJ. Ride 100-mi one-way to Rio Grande, NJ. Every cyclist rides in an assigned platoon with a Team Foster leader. Sun. Sept. 15, 2019, #CaringForRare Bicycle Event, Flemington, NJ. Ride 31, 62 or 100 mi in Hunterdon and Bucks Counties. See Sept. 14 above for towpath ride. Benefits Avery's Hope. Sun. Sept. 15, 2019, Breakthrough Bike Challenge, Daniel Boone Homestead, Birdsboro, PA. Ride 12, 25 or 50 mi through the scenic, low-traffic Oley Valley. Benefits Penn Medicine’s Abramson Cancer Center. Sun. Sept. 22, 2019, Tour de Summer Camps, Morristown, NJ. Ride 18, 36 or 62 mi. $180 minimum fundraising; benefits the Jewish Federation of Greater MetroWest NJ. Sat. Sept. 28, 2019, Bike the Brandywine, Chadds Ford, PA. Ride 25, 45, 62 or 80 mi, rolling-hilly, through the beautiful Brandywine Creek Greenway and surrounding countryside. Benefits the Brandywine Conservancy. Sat. Sept. 28, 2019, Fall VeloFest, Valley Preferred Cycling Center (Trexlertown Velodrome), Breinigsville, PA. Outdoor swap meet. 8:30am to 2:00pm. Sun. Sept. 29, 2019, Bicycling Fall Classic, Valley Preferred Cycling Center (Trexlertown Velodrome), Breinigsville, PA. Ride 10, 25, 50 or 90 mi ending with a Roubaix-style lap around the velodrome. Wed.-Sun. Oct. 2-6, 2019, Tour de Pines, various start locations in the Pinelands National Reserve, NJ. Five consecutive, but not contiguous, single-day (loop) bicycle tours of the scenic, low-traffic New Jersey Pinelands. Ride 1-5 days for one low registration fee. This unusual event has ride leaders, but no road markings - read the F.A.Q. (PDF). Bring or buy your own food. The ride leaders will average 11-13 mph, but faster groups will go off the front and follow the cue sheet. Benefits the Pinelands Preservation Alliance. 2019 date from Facebook. Oct. 4-6, 2019, YSC Tour de Pink East, Princeton NJ. Riders enjoy three days of fully-supported cycling around the Princeton area. Options include a 100-mi ride and a one-day ride. Benefits the Young Survival Coalition (YSC), an organization dedicated to the critical issues unique to young women diagnosed with breast cancer. Sat. Oct 5, 2019, Adamstown Dirty Dozen Hill Climb, Reinholds, PA. Ride 68 mi with 9,900 ft of climbing. Hill gradients of 13-to-20% with 16 timed hills. Free craft beer tasting and pizza after the event. Sat. Oct. 5, 2019, Main Line Animal Rescue Gran Fondo, Chester Springs, PA. Ride 9, 25, 31 or 62 mi on the beautiful rolling hills of Chester County, with up to 4 timed hill climbs, followed by a post-ride beer garden party. Fundraising is optional. Benefits Main Line Animal Rescue and Pennsylvania SPCA. Sat. Oct. 5, 2019, Tour de Blairstown, Blairstown, NJ. Ride 25, 40 or 62 mi on rolling-hilly terrain (1,600-4,000 ft of climbing) through scenic Warren County. Benefits the Foodshed Alliance. Sun. Oct. 6, 2019, Bike4Beds Harvest Ride, Breinigsville, PA. Ride 30 mi relatively flat or 62 mi with a climb up Hawk Mountain. Fundraising is optional. Benefits orphanages in Haiti and rebuilt schools and hospitals in Africa and Haiti. Rain date Oct. 20, 2019. Sat. Oct. 12, 2019, New Holland Bicycle Race, New Holland, PA. Ride/race 30, 50+ or 82 mi through scenic Lancaster County with 2000-6000 ft climbing. Nov. 2-3, 2019, Philly Bike Expo, PA Convention Center, Philadelphia, PA. Bicycle Mileage Logs for 2019 are available now! 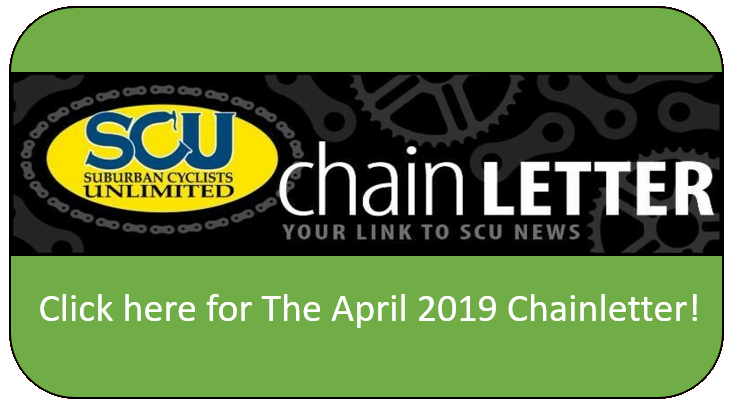 Follow the link or use the main menu to go to the SCU Document Library, then click on the little yellow folder icon next to "Ride Documents". The new SCU Universal Mileage Log is good for any year. It provides automatic summation of mileage and number of rides, and it computes the average ride distance. In addition to the numeric data, the log displays six charts as shown in the photo (populated with simulated ride data in order to demonstrate the charting). The 2018 Quad County Metric slideshow is online now! Bicycle Tour Network - formerly known as the National Bicycle Tour Directors Association. Unless marked "SCU", events on this calendar are not supported by, nor affiliated with, Suburban Cyclists Unlimited. The listing of an event in this calendar does not constitute an endorsement by SCU or by the editor. All rides and activities posted on this list are the sole responsibility of the individual organizers of and participants in the ride or activity. All participants in rides and activities appearing on this list do so at their own risk and assume responsibility for all hazards, injuries, and other risks inherent in such rides and activities. Roads will be open to motor-vehicle traffic; extreme caution must be used while riding. Events and dates are subject to change! Although this list is compiled from reliable sources, SCU and the editor are not responsible for errors or omissions. Please contact the event sponsor to confirm the date, registration deadlines and fees, start times, and services provided. We do not predict dates based on the prior year's calendar. When requesting information by mail, please send a S.A.S.E. to the sponsor. All distances are listed in miles ("mi"). To convert to metric: 1 mi = 1.6 km; 1 km = 0.62 mi. 31 mi = Half Metric Century (50 km); 62 mi = Metric Century (100 km). All rides are on-road tours unless noted off-road. All events provide water stops, cue sheets, marked route, and SAG support, unless noted, but SCU is not responsible for the services provided at events on this calendar. All rides return to the starting location unless marked "one-way". Two-day events are Saturday-Sunday and three-day events are Friday-Sunday unless marked otherwise. There are no ride leaders for these events, and you ride at your own pace. Suburban Cyclists Unlimited does not list other clubs' rides that conflict with the major SCU events (May 18, 2019 - Quad County Century). Commercial tours are not listed other than from sponsors of SCU or at the discretion of the editor. Indoor "spinning" events and randonnee events are not listed on this calendar. Suburban Cyclists Unlimited is a recreational bicycle club, and we do not support or promote racing. Triathlons, duathlons, amateur races, criteriums and time trials are not listed on this web site. This is Jack's 20th year of editing the SCU Regional Calendar! This page was updated on 4/22/2019 by Jack Elias, Regional Events Editor. NOTE: The start location must be within 150-miles driving distance of Hatboro-Horsham High School, Horsham, PA, as determined by Google Maps. Recreational rides only! As of January 1, 2019, events in Maryland, New York and Connecticut will no longer be listed on this calendar. Please include the name and date of the event and the link (URL) to the event's website. Do not send attachments (flyers, brochures, posters, logos, photos, images, graphics, etc. ).